Harry Mulligan: Morning Crispian, we’re seeing a lot of twenty year anniversaries of seminal records from bands from the Britpop years like the Jesus and Mary Chain’s Psychocandy. What’s it like for Kula Shaker revisiting K? Crispian Mills: Well, K being our first album, it’s like connecting with why you started playing music in the first place, and that’s empowering and that’s exciting. Recording the companion album- K2.0 turned out to be a very successful and creative process, especially considering how the anniversary took us by surprise. We had no idea that twenty years was coming around, so we kind of had to drop everything and rush into the studio. But the record turned out really great. When the band started playing again, we were on fire. There was no case of mothballs, and creaky joints haha. It just sounded brilliant, which was very surprising. Harry Mulligan: Can you tell me a little about the bands creative process with the record and who you had produce it, and any highlights that came up during that process? Crispian Mills: Well, we’ve been lucky enough to work with some of the best producers in the world during our career: Rick Ruben, Bob Ezrin, George Drakoulias, John Leckie, Steve Harris, but you know, you get to a point where you’re ready to do it completely on your own. It’s a process we started in 2006, but Pilgrim’s Progress was the first record where we felt like we were really coming into our own in the studio. The same goes for K2.0, which we also produced ourselves. We tend to do a lot of song writing and demoing, and developing individually, and then we’ll start sharing. Sending each other files and so on. My demos are always very scrappy, acoustic guitar, vocals, basically just sung down the condenser mic onto my computer, like a glorified Dictaphone. Alonza’s demos are a little more produced, with drums on them and stuff. That’s how it all starts usually. On the opening track, Infinite Sun, we also did a little playing through, as it’s a performance based track, so you need to see how it would work live and all sorts of ideas come out of smashing it. We decided we needed a great analog & valve friendly studio to do all the backing tracks, so we went to State of The Ark which is in London. It’s got the EMI, Paris desk from the seventies. If you’re playing rock n roll, you need to have that channel separation and warmth. I don’t HOW it sounds better, but it does. So, we did the backing tracks there, and then we worked on it later. We have a studio in Belgium in an old barn where Alonza lives. That’s where we tinker. Then we mixed back in London with Mark Blackwell who I worked with in the Jeevas. HM: So you’re recording on two-inch tape and mixing with Pro Tools sort of thing? CM: Yeah – The main thing you use tape for is drums, guitar, voice, acoustic, things like that. We love that Tape compression. Drive it Hard, baby. Then you can start to do BV’s, editing, whatever, on tools or logic or whatever. Back when we were kids, and we recorded K, if you wanted to edit drums, you were still cutting up tape with razor blades, and sticking it back together again. It’s funny to think that now. Only 20 years ago, but it was another age. Technology has just completely changed the landscape of music; how you record it, how you listen to it, how you distribute it. HM: Sure. In the past you’ve written songs like Here Come My Demons that kind of conceptually highlight the Shadow Self or the dark side and do you feel that you have all emerged individually and collectively into a good place from the excesses of Britpop? CM: ha ha ha. Yes! I think we are a pretty tight family. The excesses of Britpop weren’t just about ‘lager lager’, the excess was rooted in an over-inflated sense of Self Importance, which was all over the place. We are a pretty happy bunch, and appreciate each other’s company. Actually, Here come My Demons was a lyric that I stole from my five year old son, Keshava. We’d been reading fairytales and he was singing this song, and I asked ‘What are you singing?’ and he said: ‘It’s my song: Here Come My Demons’ and I thought: ‘I’ll have that. `If John Lennon can steal from his son Julian’s ‘Lucy in the sky with Diamonds’ – then so can I. From the mouths of babes. HM: What does your son call you? Does he call you Krishnakanta, Dodge or Crispian? CM: Well, we all have different names according to our relationships, don’t we? Everyone does. So, obviously I’m ‘Dad’, but sometimes I’m ‘Oi, You’, but you know, it’s funny: ‘What’s Govinda?’ for instance, that’s one of the questions that came up a lot, and ‘what’s the difference between Govinda and Krishna?’ That’s a perfect example of the difference between names. Govinda is a name of Krishna, a name of God, the Infinite Soul. So the Vedas explain how, if there is a God, and God is infinite, then he also has infinite names, which relate to distinctive relationships. The most intimate, or loving names are those of Krishna in his childhood, and Govinda is the name of the cowherd boy, playing with his friends. It’s a very sweet story. HM: How much did your mother and grandparent’s spirituality influence you growing up. And where are you at? CM: Where am I at? Who knows! You are always looking back at yourself and you think, twenty years ago I didn’t have a clue. But twenty years from now I’ll look back and hopefully say the same thing about now. But Spiritual life is like that, it’s supposed to be the opposite of the material life, in that it’s constantly fresh, it’s always developing and evolving. I’m in a place, like a lot of people, trying to reconcile your spiritual ideals with the misery of everyday material life, haha. The world we see around us, which is completely insane. It makes no sense at all. I think, all things considered, I’m in a pretty healthy place. Kids are good for keeping your feet on the ground. My grandad (John Mills) was a simple hearted guy and he always said as much. He loved people. He took great pleasure in being around people and he loved them and they loved him and that was kind of his special Gift – friendship. My Grandma was a typical mad Celt; slightly depressed, with a flaming temper, and she was very, very funny, and very imaginative. She was a great writer and she was the one who was a bit more bleak, cynical outlook about people. So they balanced each other out very well. Her family has generations living and working in China, as her dad had worked for the British in China, and her great grandfather had been a Missionary from Belfast. So they had been out there and they had a deep appreciation for the more Eastern view on life and death. The revolving cycle of Samsara – of birth and death. HM: As opposed to Judeo-Christian? CM: Yeah, I think they were slightly more open to the transmigration of the Soul, and the Soul evolving and learning from more than one life time. There is a lot of evidence that Jesus taught the same thing. It doesn’t get in the way of Jesus’ original teachings. HM: You’ve been noted for saying in the past that England will rise again, can you say something about that? CM: I never said that. It’s a wrongly attributed quote on Wikipedia. Some fool claims you say something, it gets printed in a paper, then Wikipedia contributors cite it as a reference. For the record, I’m not interested in a pile of earth… You know, there was an interesting program on BBC the other day, about Hadrian’s Wall, and how the Roman’s just arbitrarily cut an island in half, put up the wall and created the border. It’s no different to the way they carved up the Middle East after the First World War. You end up with all these people, living on the same planet, on the same piece of earth, fighting over illusory, man-made borders. ‘We are one in the infinite Sun’ right? I believe in a land can have a ‘spiritual heart’ – but that’s ‘elemental’ philosophy – in which everything is alive, everything is conscious, every tree, every river. Being connected to the earth also means living in harmony with your environment. You might says, that’s the problem with the world right now. No one is living in harmony with the environment. There’s no knowledge of, let alone respect, for the sacred life force that permeates our beautiful world… Jedi out there know what I’m talking bout. HM: On this record, which compositions resonated for you the most for you? CM: Well, my songs are my babies, so they’re all special to me and can’t pick out a favourite. We chose Infinite Sun as the opening track because it was one of the first songs we had played as a band, and used to jam it when we were nineteen at Green Gatherings to people living in teepees. That really took us back to the beginning. It’s nice to complete the circle by getting back to that moment of genesis, where we were just a bunch of kids playing at parties and festivals. HM: What are the plans for the foreseeable future for the Band? CM: To get to the end of this year and take stock! We’ve recently finished a Live record that we are really happy with, which will be getting released very soon. Making a good Live album is something we’ve been trying to do for years and years, because that’s primarily what we are – a Live band, and it’s always been incredibly hard to capture the atmosphere on a recording. So somehow we’ve finally done it and everyone is happy. HM: Any studio record in the offing? CM: It’s inevitable, but I don’t know when. HM: Crispian, thank you very much for taking the time to talk to me this morning. 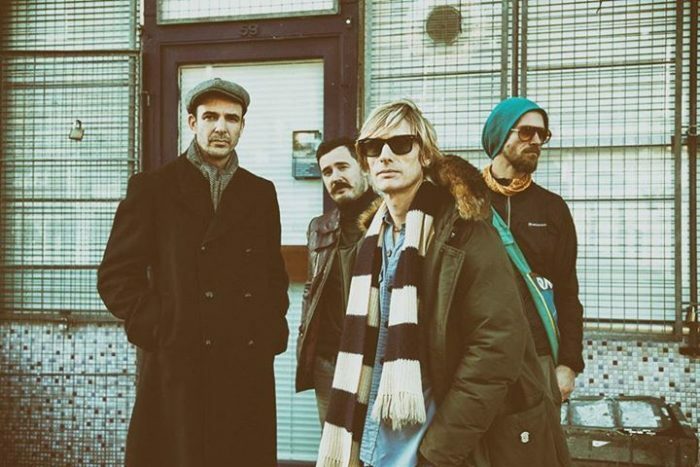 Kula Shaker’s official website is : www.kulashaker.co.uk for more details. They are also on Facebook and Twitter. Words by Harry Mulligan, you can find more at his Authors profile here.